This article is about the enzyme that precedes the citric acid cycle. For the enzyme that forms acetaldehyde, see Pyruvate decarboxylase. Pyruvate dehydrogenase is the first component enzyme of pyruvate dehydrogenase complex (PDC). The pyruvate dehydrogenase complex contributes to transforming pyruvate into acetyl-CoA by a process called pyruvate decarboxylation. Acetyl-CoA may then be used in the citric acid cycle to carry out cellular respiration, so pyruvate dehydrogenase contributes to linking the glycolysis metabolic pathway to the citric acid cycle and releasing energy via NADH. Crystallographic structure of pyruvate dehydrogenase (PDH). PH is a six domain dimer with α (blue), α’ (yellow), β (red), and β’ (teal) regions denoted by the different colors. Thiamine pyrophosphate (TPP) is shown in grey ball and stick form, two magnesium ions in purple undergoing metal ligation with the TPP, and two potassium ions in orange. Pyruvate dehydrogenase (E1) performs the first two reactions within the pyruvate dehydrogenase complex (PDC): a decarboxylation of substrate 1 (pyruvate) and a reductive acetylation of substrate 2 (lipoic acid). Lipoic acid is covalently bound to dihydrolipoamide acetyltransferase (E2), which is the second catalytic component enzyme of PDC. The reaction catalyzed by pyruvate dehydrogenase (E1) is considered to be the rate-limiting step for the pyruvate dehydrogenase complex (PDHc). Phosphorylation of E1 by pyruvate dehydrogenase kinase (PDK) inactivates E1 and subsequently the entire complex. 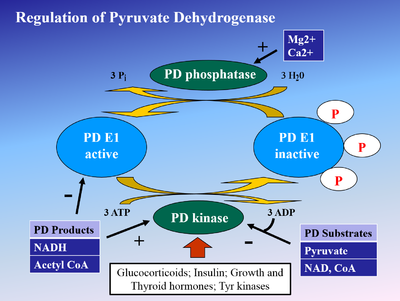 PDK is inhibited by dichloroacetic acid and pyruvate, resulting in a higher quantity of active, unphosphorylated PDH. Phosphorylaton is reversed by pyruvate dehydrogenase phosphatase, which is stimulated by insulin, PEP, and AMP, but competitively inhibited by ATP, NADH, and Acetyl-CoA. The ylide resonance form of thiamine pyrophosphate (TPP) begins by attacking the electrophilic ketone of pyruvate. The intermediate β-alkoxide then decarboxylates and the resulting enol is deprotonated on the carbon atom to form a stabilized 1,3-dipole involving a positively charged nitrogen atom of the thiamine heterocycle. This 1,3-dipole undergoes a reductive acetylation with lipoamide-E2. Biochemical and structural data for E1 revealed a mechanism of activation of TPP coenzyme by forming the conserved hydrogen bond with glutamate residue (Glu59 in human E1) and by imposing a V-conformation that brings the N4’ atom of the aminopyrimidine to intramolecular hydrogen bonding with the thiazolium C2 atom. This unique combination of contacts and conformations of TPP leads to formation of the reactive C2-carbanion, eventually. After the cofactor TPP decarboxylates pyruvate, the acetyl portion becomes a hydroxyethyl derivative covalently attached to TPP. E1 is a multimeric protein. Mammalian E1s, including human E1, are tetrameric, composed of two α- and two β- subunits. Some bacterial E1s, including E1 from Escherichia coli, are composed of two similar subunits, each being as large as the sum of molecular masses of α- and β- subunits. Pyruvate dehydrogenase E1 subunit of E. coli. Colors represent different chains. Structure determined by Arjunan et al. Biochemistry 2002. Created with PyMol. E1 had two catalytic sites, each providing thiamine pyrophosphate (TPP) and magnesium ion as cofactors. The α- subunit binds magnesium ion and pyrophosphate fragment while the β-subunit binds pyrimidine fragment of TPP, forming together a catalytic site at the interface of subunits. The active site for pyruvate dehydrogenase (image created from PDB: 1NI4​) holds TPP through metal ligation to a magnesium ion (purple sphere) and through hydrogen bonding to amino acids. While over 20 amino acids can be found in the active site, amino acids Tyr 89, Arg 90, Gly 136, Val 138, Asp 167, Gly 168, Ala 169, Asn, 196, and His 263 actually participate in hydrogen bonding to hold TPP and pyruvate (not shown here) in the active site. The amino acids are shown as wires, and the TPP is in ball and stick form. The active site also aids in the transfer of the acyl on the TPP to a lipoamide waiting on E2. Pyruvate dehydrogenase is targeted by an autoantigen known as anti-mitochondrial antibodies (AMA), which results in progressive destruction of the small bile ducts of the liver, leading to primary biliary cirrhosis. These antibodies appear to recognize oxidized protein that has resulted from inflammatory immune responses. Some of these inflammatory responses could be related to gluten sensitivity as over 50% of the acute liver failure patients in one study exhibited a nonmitochondrial autoantibody against tissue transglutaminase. Other mitochondrial autoantigens include oxoglutarate dehydrogenase and branched-chain alpha-keto acid dehydrogenase complex, which are antigens recognized by anti-mitochondrial antibodies. Pyruvate dehydrogenase (PDH) deficiency is a congenital degenerative metabolic disease resulting from a mutation of the pyruvate dehydrogenase complex (PDC) located on the X chromosome. While defects have been identified in all 3 enzymes of the complex, the E1-α subunit is predominantly the culprit. Malfunction of the citric acid cycle due to PDH deficiency deprives the body of energy and leads to an abnormal buildup of lactate. PDH deficiency is a common cause of lactic acidosis in newborns and often presents with severe lethargy, poor feeding, tachypnea, and cases of death have occurred. ^ a b c d e PDB: 1ni4​; Ciszak EM, Korotchkina LG, Dominiak PM, Sidhu S, Patel MS (June 2003). "Structural basis for flip-flop action of thiamin pyrophosphate-dependent enzymes revealed by human pyruvate dehydrogenase". J. Biol. Chem. 278 (23): 21240–6. doi:10.1074/jbc.M300339200. PMID 12651851. ^ a b Molecular graphics images were produced using the UCSF Chimera package from the Resource for Biocomputing, Visualization, and Informatics at the University of California, San Francisco; Pettersen EF, Goddard TD, Huang CC, Couch GS, Greenblatt DM, Meng EC, Ferrin TE (October 2004). "UCSF Chimera—a visualization system for exploratory research and analysis". J Comput Chem. 25 (13): 1605–12. CiteSeerX 10.1.1.456.9442. doi:10.1002/jcc.20084. PMID 15264254. ^ Jaimes, R 3rd (Jul 2015). "Functional response of the isolated, perfused normoxic heart to pyruvate dehydrogenase activation by dichloroacetate and pyruvate". Pflügers Arch. 468 (1): 131–42. doi:10.1007/s00424-015-1717-1. PMC 4701640. PMID 26142699. ^ Arjunan P, Nemeria N, Brunskill A, Chandrasekhar K, Sax M, Yan Y, Jordan F, Guest JR, Furey W (2002). "Structure of the pyruvate dehydrogenase multienzyme complex E1 component from Escherichia coli at 1.85 A resolution". Biochemistry. 41 (16): 5213–21. doi:10.1021/bi0118557. PMID 11955070. ^ Leung PS, Rossaro L, Davis PA, et al. (2007). "Antimitochondrial antibodies in acute liver failure: Implications for primary biliary cirrhosis". Hepatology. 46 (5): 1436–42. doi:10.1002/hep.21828. PMC 3731127. PMID 17657817. ^ Recny MA, Hager LP (1982). "Reconstitution of native Escherichia coli pyruvate oxidase from apoenzyme monomers and FAD". J. Biol. Chem. 257 (21): 12878–86. PMID 6752142. ^ Abdel-Hamid AM, Attwood MM, Guest JR (2001). "Pyruvate oxidase contributes to the aerobic growth efficiency of Escherichia coli". Microbiology. 147 (Pt 6): 1483–98. doi:10.1099/00221287-147-6-1483. PMID 11390679.